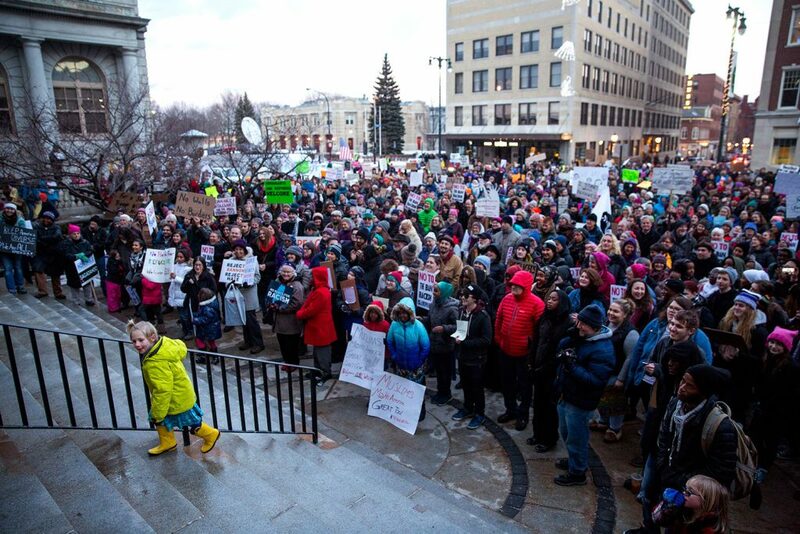 The crowd shows support for Maine's Muslims and immigrants in response to the president's suspension of refugee programs and admissions from seven Muslim-majority nations. About 1,500 people gathered Wednesday afternoon outside Portland City Hall to protest President Trump’s order banning citizens of seven Muslim-majority countries from entering the United States. People chanted, “No hate. No fear. Immigrants are welcome here,” and held signs with messages such as, “We are all immigrants,” “Build bridges, not walls” and “No to the ban, racism and Islamophobia.” The Portland Street Choir sang “We Shall Overcome” as people arrived for the rally. Demonstrators spilled out of City Hall Plaza, prompting police to close a short section of Congress Street during the hour-long event. 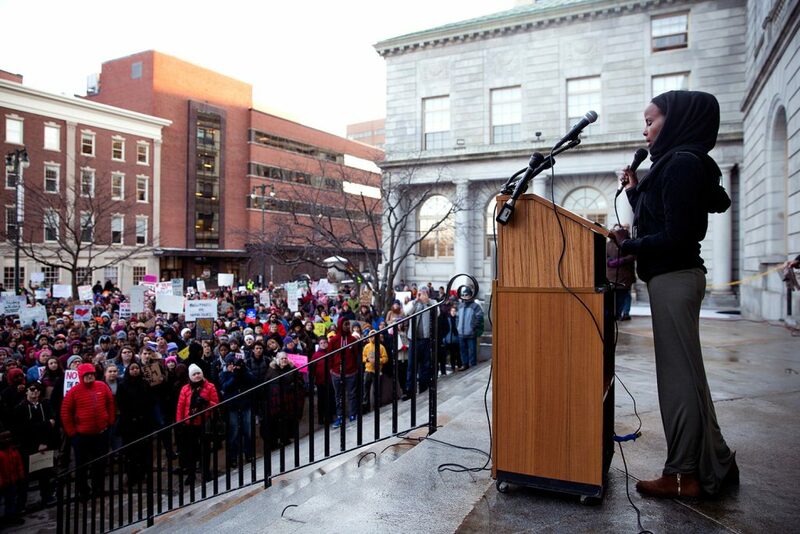 “I’m so excited that so many people from our community came to show solidarity with the Muslim community,” said event organizer Hamdia Ahmed, a 19-year-old sophomore at the University of Southern Maine. 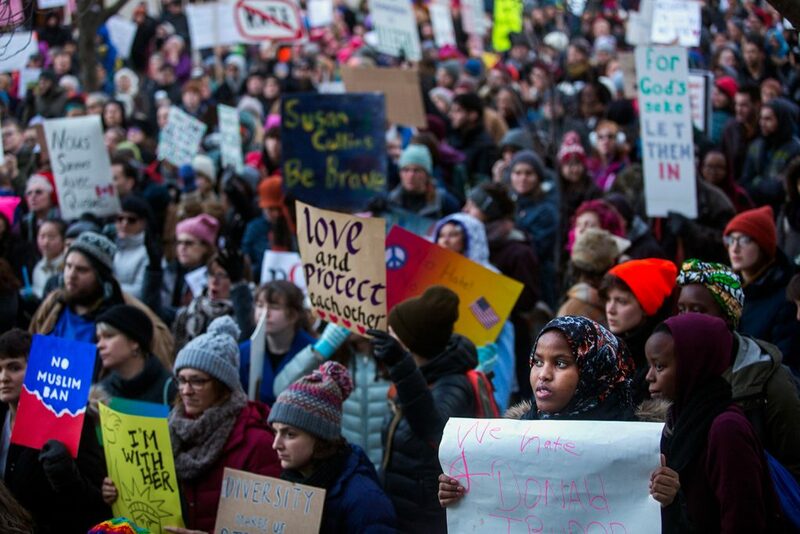 The protest was sparked by a series of immigration orders by Trump that have drawn widespread condemnation from immigrant, civil rights and human rights advocates, as well as career diplomats in the U.S. State Department. On Monday, Trump fired acting Attorney General Sally Yates after she ordered the Department of Justice not to defend the order he issued last week to temporarily halt immigration from seven Muslim-majority nations. Trump’s order includes a 120-day suspension of the U.S. Refugee Admissions Program and a 90-day ban on people entering the U.S. from Iraq, Syria, Iran, Sudan, Libya, Somalia and Yemen – all Muslim-majority nations. The order is widely seen as Trump’s effort to make good on a campaign promise to ban Muslims from entering the U.S. 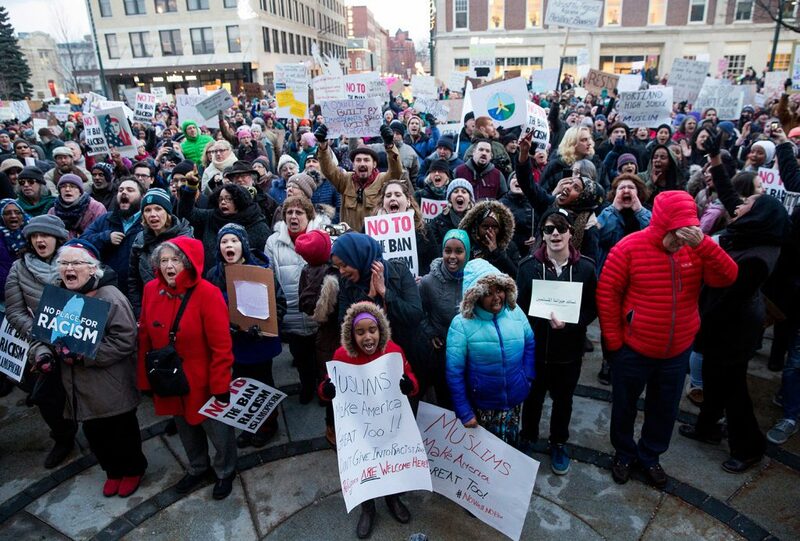 In response to his action, protesters filled airports across the country last weekend, including the Portland International Jetport, where more than 2,000 people gathered Sunday in opposition to the ban. A separate rally the same day at Portland City Hall drew about 1,200 people. Portland police estimated Wednesday’s crowd at 1,500 people. During the rally, Ahmed said a war in Somalia forced her mother to flee with her five children to a refugee camp in Kenya, where the family waited for seven years to earn refugee status, which was granted after a series of interviews and background checks. Like others in the camp, Ahmed’s family wanted only a safe place to live and a chance to build a life. Ahmed said she still has family members in refugee camps. “Some of us are afraid we will not be able to reunite with our families, like me,” she said. Jeffery Young, a civil rights attorney, said that as a Jew, he sees Trump’s actions as “eerily similar” to actions taken during the Holocaust. At that time, he said, a fear that Nazi spies would infiltrate the U.S. prompted America to heighten security, tighten visa requirements and ramp up screening. As a result, millions of Jews were killed. Leslie Silverstein, president of the board of directors of the Portland-based Immigrant Legal Advocacy Project, which provides free legal services to immigrants, sought to reassure the immigrant community. According to the advocacy project, Trump’s immigration order is affecting 76 cases in Portland, primarily of people from Somalia and Iraq. Many of those people, who are already in Maine, are trying to bring family members to the U.S.
Executive Director Sue Roche said in an interview that 17 of those cases involve one or more family members who are abroad and whose cases have been suspended during the ban. An additional 17 cases are nearly in the pipeline, many of which involve consultations about how to legally bring family members to the U.S., she said. 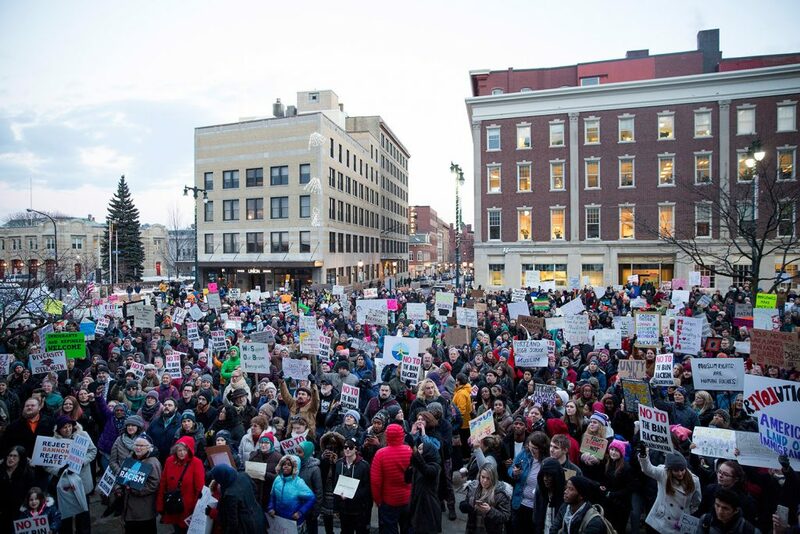 Also Wednesday, the American Civil Liberties Union of Maine released a letter co-signed by 34 legal, immigrant, civil rights and religious groups, as well as elected officials from Portland and Lewiston, opposing Trump’s immigration order. Trump also signed an order to strip funding for “sanctuary jurisdictions,” a term that lacks a clear definition but is generally understood as a community that refuses to cooperate with federal immigration investigations. 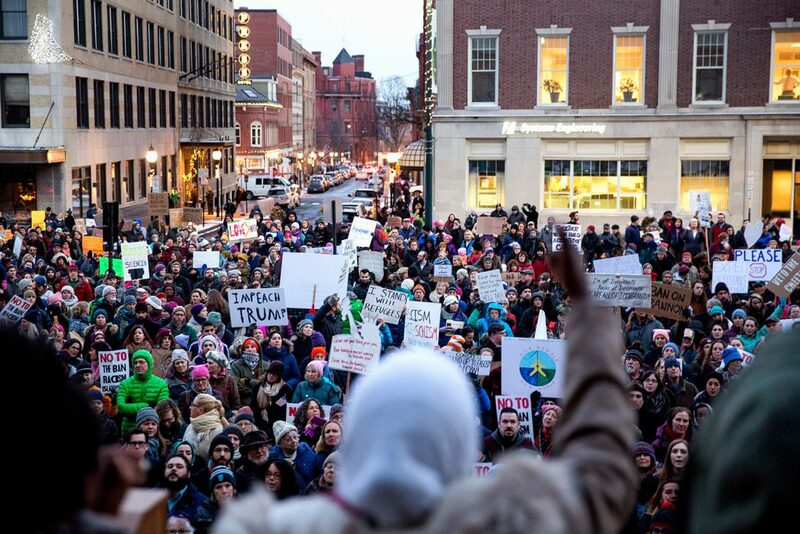 There are no sanctuary cities in Maine, but efforts are afoot in Portland, Hallowell and Gardiner to show support for immigrants. Portland is already a welcoming city for immigrants. 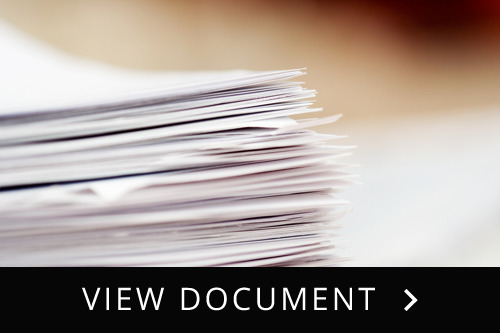 Since 2003, a city ordinance has prohibited city employees, including police, from inquiring about a person’s immigration status unless they suspect that person had been deported, returned and committed a felony. Portland, however, does work with federal authorities on immigration issues, including providing a uniformed presence during raids. This is not the first time Trump has sparked a protest in Portland. During a campaign stop last summer, he linked an increase in crimes to Somali immigrants, who have settled in significant numbers in Portland and Lewiston. Police chiefs in those communities disputed that characterization, saying the opposite was true. A day later, hundreds of immigrants and native Mainers gathered in front of Portland City Hall to denounce Trump and show support for immigrants. On Wednesday, Mayor Ethan Strimling again sought to reassure immigrants that they will be safe in Maine’s largest city.